Our flight today had us rolling down runway 22 at 0600 as the sun was about to peak above the Blue Ridge Mountains. After liftoff we turned northeast heading for Philadelphia PA where we would meet our little passenger Evelyn and her mom Sarah. Even though Evelyn is dealing with a serious condition (Idiopathic Pulmonary Fibrosis) you would never know it when you lay your eyes on her smiling face ! (So much strength and inspiration in such a small package !) You just want to hug her until she pops when you meet her ! Once we loaded up and received our IFR clearance we departed Philadelphia Northeast heading for Akron Ohio. At this point we were slightly behind schedule (We had already informed Rob, the second leg Angel Flight Pilot of our delay). We actually had another slight delay before being cleared for takeoff…… as we taxied towards runway 6, an airplane had just landed with some type of problem, which left him disabled along the runway, so the tower gave us new taxi instructions to allow us to depart from runway 33. During this time and after liftoff, Evelyn was very happy about flying and she was having a lot of fun playing with the pink stuffed dragon that had been awaiting her in her seat…..but then, only a few moments later, she was fast asleep and continued a nice nap for most of our flight (This was probably a very good thing due to the long day her and her mom would have getting home) Our flight conditions heading to Akron were overall very good at 4000 feet (We normally would not fly this low, but due to Evelyn’s dependence on supplemental oxygen and the fact that we are not pressurized, we needed to stay fairly low) We had a very slight headwind (Thanks to being low) and the ride for the most part was smooth…. with a few bumps (pot holes) over the mountains, visibility was very good. At one point ATC wanted us at 6000 feet, but once they were informed about our needs they ask if we could do 5000 feet, to which we complied and all was good. (We think the Guys and Gals of ATC….. “Air Traffic Control” ….. are really a Great Bunch, and try very hard to work with you when they can !) Flight time getting to Akron was 2.8 hours covering 307 nautical miles. Once Akron Fulton was in sight we canceled our IFR and made a visual approach and landed on runway 7. Rob (Evelyn and Sarah’s next Angel Flight Pilot) and his co-pilot were waiting for them with their Cessna 210. After exchanging greetings and introductions we were greeted inside of Summit Air by Reagan (the very nice young lady behind the desk) that informed us that nice warm cookies were waiting to be enjoyed ! (She won our hearts…. and ok… maybe our stomachs !) To say in the least, her hospitality was top notch. (We keep a special list of all airports that have cookies waiting for incoming pilots !) After getting several photos and saying our goodbyes…. (which was hard, we really wanted to bring Evelyn home with us !) we boarded up and departed Akron from runway 7, planning on getting our IFR clearance in the air…. but…. due to the delays our clearance was void (past time) so we ask for and received flight following. At that point we headed on up to 9500 feet where we took advantage of a 40 knot tailwind (giving us a ground speed that at some points reached over 190 MPH !) After reaching our cruise altitude John broke out the “IAP” (In Air Picnic) of which we very much enjoyed while watching out from the best office view in the world. Flight conditions home were very smooth with the great tailwinds and only the slightest wave action once over the mountains. Once over the Beautiful Shenandoah Valley we canceled our flight following and descended into Luray landing on runway 4. After tucking 49Bravo back into her hanger we enjoyed a nice cup of coffee and then began what would be our 2nd most dangerous part of the day (heading home)….. the 1st most dangerous part of the day was heading to the airport early that morning (in the dark) ! Such a joy to have met Evelyn, what an inspiration to us and to anyone that has had the pleasure to meet her ! ……… we wish her the very best that life has to offer ! Following are some photos of the day….. Hope you enjoy …. and as always, thanks for viewing ! Backseat ready for Evelyn ! Our office for the day ! Reagan at Summit Air in Akron was such a sweetie ! She had fresh baked cookies waiting for us ! Captain John with Reagan (Staff of Summit Air)……… this is the look of a Pilot after having a fresh baked cookie ! Evelyn full of energy after her nap on our flight ! The blimp airdock at Akron Fulton Airport, in Akron, Ohio. Completed in 1929, it was the world’s largest structure without interior supports. Originally built by Goodyear, it is now owned by Lockheed Martin. We would love any comments ! Here are some previous comments……..
Bonnie Hammond (May 11th 2017) : I can’t tell you both enough how special you are. You both are caring, loving and amazing men. I am so proud of you both. Thank you both for all you do and continue to do. God Bless you both. Pam and Chuck Gruber in WVA (May 11th 2017) : This story has made our day !!!! What wonderful, selfless service you ALL provide . Our heartfelt thanks to each of you !!! so Orderly when looking down from above. Hi Pilot John and Pilot Nevin! Christmas blessings to you! This is the first time i have been able to take time to hop on your site and peek at this trip of ours together from last spring. (Three young kids and then some medical stuff on our plate keeps us kind of busy.) You have such great and precious photos to document parts of our story together! Love them! Evelyn is doing great and I will come back to this site some time soon with the good news of new and improved management of Evelyn’s Pulmonary Arterial Hypertension (PH). She is such a tough and brave kid in so many ways. So wonderful to have flown with you! Evie still has and adores her pink stuffed toy dragon! We hope we get to fly with you guys again sometime this spring 2018 for Evelyn’s annual trip to Philadelphia’s CHOP for her annual right heart cath with her Pediatric PH team. Grace, peace, joy, wisdom and health to you and your loved ones! Thank you so much for your comment Sarah ! We are so glad Evelyn is doing well !!!!! 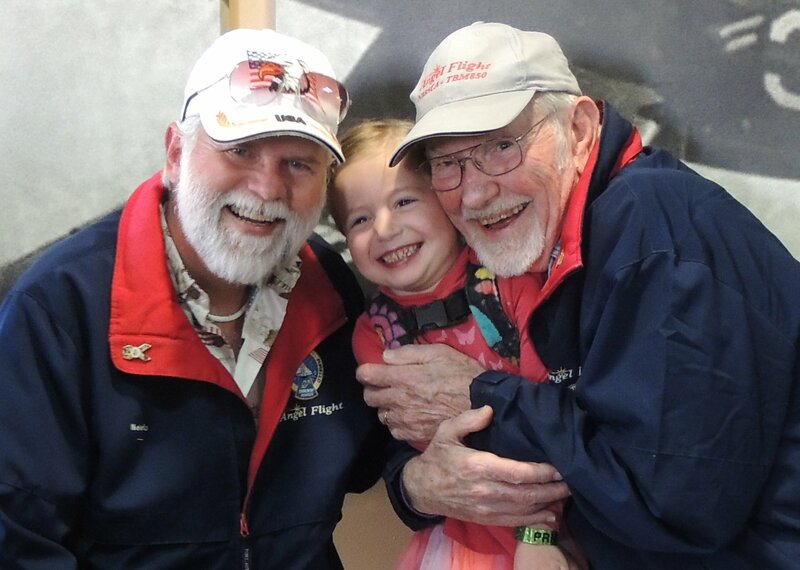 Be sure to tell her “Hi” from her Angel Flight Pilot’s Captain John and Nevin ! Hope the New Year brings you and your Family many, many Blessings !